After applying foundation, pick up the product with the Secret Camouflage Brush by dragging across both pans, saturating both sides of the brush. Using the back of your hand as a palette, use the brush to warm and mix the two colors until you find the shade that matches your skin tone. Secret Camouflage is a true makeup artist's formula, so the more you work with the product the more easily you will be able to achieve perfect results. Wipe off the excess product on a clean area of your hand to de-saturate the brush. Using feather-light strokes, apply Secret Camouflage to the darkened areas of the face: blemishes, shadows, scars, capillaries, the area around the nose, shadows under the bottom lip, and any imperfections that the foundation does not cover. After application, pat the product lightly with your fingertips and set with Translucent Loose Setting Powder using the Camouflage Powder Brush. 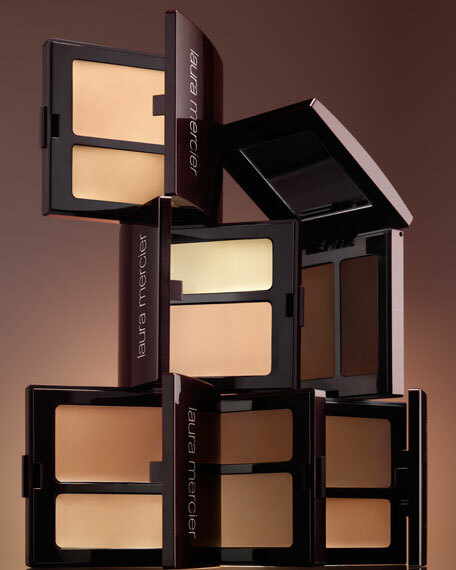 Translucent powder sets the product for all day wear. Apply to shadows under and on the outside corner of the eyes. Use the fingertip to gently pat and blend all areas of application. Set with Translucent Loose Setting Powder using the Camouflage Powder Brush. Do not use a pigmented powder to set Secret Camouflage as it will cause you to look "tired" underneath the eyes and will cause the areas of application to stand out on the face. Valentine's Leather Travel Case, "I Love You"